Hilscher is pleased to announce the next milestone in the netX success story, netX 90 is now available on series! 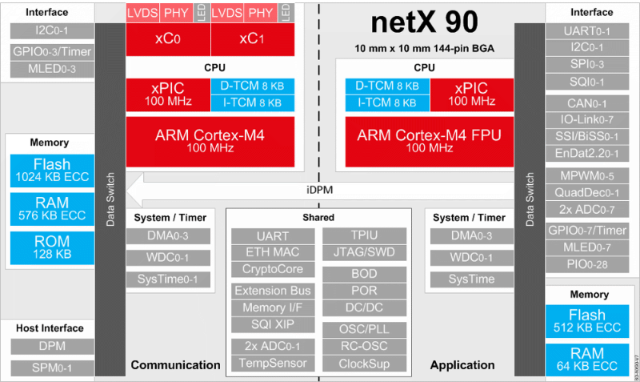 The netX 90 is a highly integrated Industrial Ethernet node in a 10x10 mm2, 144-pin BGA footprint with two Cortex-M4, on-chip Flash, Ethernet PHYs, DC/DC converter and POR circuit, which reduce the BOM costs for the hardware interface to a few passive components. The network chip’s internal architecture is logically separated in order to fulfil communication and application tasks in parallel, ensuring software quality and all relevant security aspects. The partitioning restricts the software access to on-chip peripherals on either side. For the communication, Hilscher provides a scalable software solution in terms of protocol functionality and flexibility. The application makes full use of a separate Cortex-M4 at 100 MHz with DSP and FPU support, enhanced by a feature-rich set of on-chip peripherals with connectivity. Hilscher bundled the netX 90 Starterkit with the intention to provide a quick evaluation for the netX 90 development. The netX 90 Starterkit consists of 15 samples of netX 90 for which a simplified delivery contract needs to be signed, the NXHX Development board and a support quota of 5 hours of professional netX Support to kickstart the development. Contact us for more information to the starterkit. The SoC features two flexible communication (xC) IPs, which support all popular Industrial Ethernet standards, i.e. hard real-time. Most importantly, the xC architecture flexibly adapts by software to emerging standards and future network requirements such as TSN. Built-in security features enable developers to apply a secure by design concept by building layers of security as outlined in the IEC 62443, coupled with built-in diagnostics to monitor operating conditions for IIoT-enabled cloud services, e.g. predictive maintenance. Hilscher delivers the range of software protocol stacks for communication tasks as prebuilt firmware, i.e. pre-certified. The data exchange with the protocol stack interface using the dual-ported memory (DPM) enables application developers to quickly setting up a network prototype. The netX Studio from Hilscher includes all components required to configure, develop, and debug embedded applications. The compartmentalized project manager features a set of utility tools to set up the protocol stack in three user-friendly steps. If you want to learn how the netX 90 with its ecosystem delivers the breadth of technology for your IIoT application of tomorrow, please contact us. Get in contact with your local sales representative.